Fiber gummies aren't only effective when it comes to weight loss and curbing your appetite. They are beneficial to your overall health. Fiber gummies that are based on Inulin (such as Skinny Piggies), which is a plant fiber, are great for improving bowel movements. This kind of fiber is recommended to individuals who suffer from constipation. More importantly, Inulin is a very powerful natural prebiotic that improves gut health. It regenerates the microflora in the gut and decreases potentially harmful types of bacteria. Do you love indulging in sweet treats but also hope to slim down? 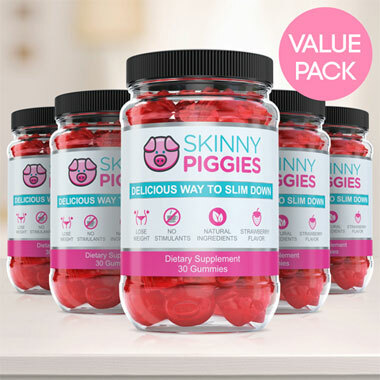 Now, there's a new dieting product that lets you to snack without guilt: Skinny Piggies! These fruit-flavored gummies are formulated to help you reduce cravings, while promoting weight loss. The key for effective weight loss means consuming fewer calories than you burn. Unfortunately for you, this usually results in an uncomfortably grumbling stomach all day long. is not hard to get: Take in fewer calories than your body burns daily and you will start losing fat, absolutely without fail! But once you start cutting back calories, and hunger and appetite become hard to manage. This is where Skinny Piggy Gummies come into play! These delicious appetite suppressant supplements are formulated to not only help you fulfill cravings, but also help you to stick with your weight loss regime by allowing you feel not hungry. Hunger is for the most part driven by: energy intake and the stretch in the stomach. After you eat food, your stomach gets full and the food stretches it. That makes you feel satisfied and you don't feel hungry and stop eating. Ok, so what now? Chew one Skinny Piggy 30 mins prior to your dinner with a large glass of water. When the Skinny Piggy reaches the stomach it absorbs the water and expands into a gentle gel. The gel takes up space in your stomach and informs your nervous system that you just ingested a good portion of food -all prior you've even eaten real food. 30 minutes later and you may begin enjoying your desired food! At that point, the gel has expanded and you are satisfied and that means you'll be able to eat a smaller sized meal and ingest fewer calories but still find yourself being full and satisfied. Have one Skinny Piggy and you will find yourself eating less calories, avoid carb cravings and let your body to burn fat while feeling full. This way you can avoid desire to eat and food cravings, hunger, and keep your caloric intake down, without feeling like you're on diet. When you use Skinny Piggies fiber gummies right before eating, they will form a gel coating around your food. That slows down the release of the carbohydrates into your blood. That helps keep your blood glucose level much more steady and ensures your body remains in fat burning mode all day long. It can even make your workout sessions feel easier. No Stimulants: Taking a weight loss product without caffeine and that's why you can take them even at night, and the gentle formula means that the product is easy on stomachs. Genuine Ingredients: Unlike most diet supplements, it's actually possible to pronounce every active ingredient in our supplements, so rest assured that you're nourishing your body with high quality ingredients. Great Taste: Very few weight loss products actually taste great, and none of them have the same taste of strawberries, and that means these gummies are a pre-meal snack you'll really enjoy. Nourishing Ingredients: In addition to helping you slim down, they will also support the healthy nails and help your skin looking healthy. 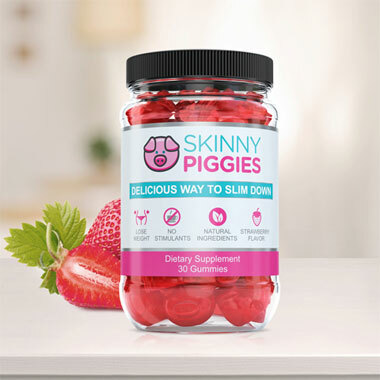 Losing weight is never easy, but Skinny Piggies are here to help you make it easier on you. You will love the strawberry flavor of our fiber gummies, so forgetting to take them daily won't be an issue. 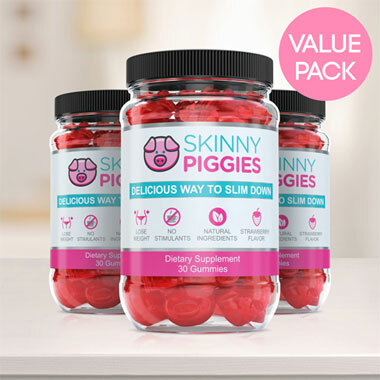 Easy to use and satisfying, Skinny Piggies are dietary supplements that can help you too.